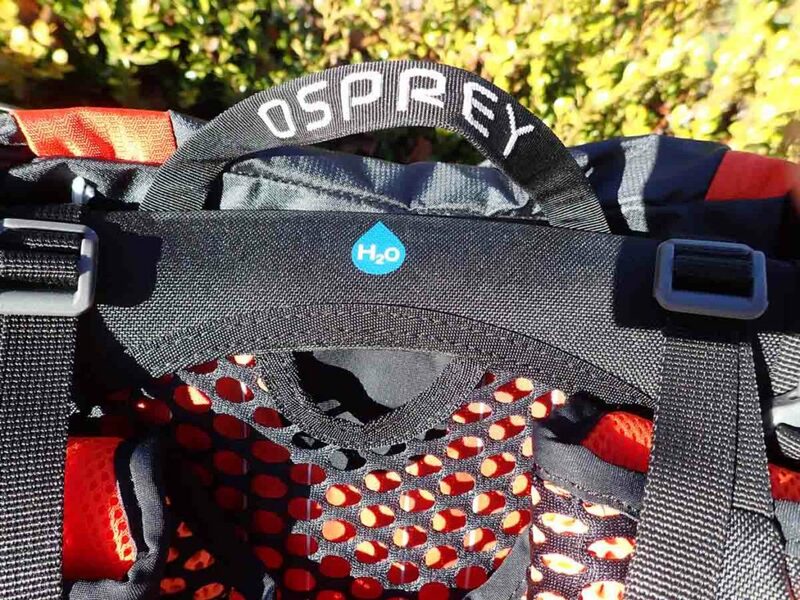 I have long been a fan of the Osprey Exos packs and have been using my pre-existing model since mid 2016. Being a bit of a gear head when the new model came out in late 2017, then reaching Australia in 2018, I couldn’t wait to get my hands on a new version hoping my perceived shortcoming from the previous model had been rectified. The previous model really only had one negative for me and that was that the hip belt pockets were too small and while they could fit snacks and even my small GPS they couldn’t fit my pocket camera. To my dismay the new model was released and not only had the hip belt pockets been removed altogether but the small mesh pockets on the shoulder straps had also gone. Not happy Jan! (for those outside Australia this is a pop culture reference). So it was with a strong preconception that I purchased my new pack expecting that I wasn’t going to be as happy with the new version as I was with my older model. So why then would I buy a new pack and what’s so special about the Exos? 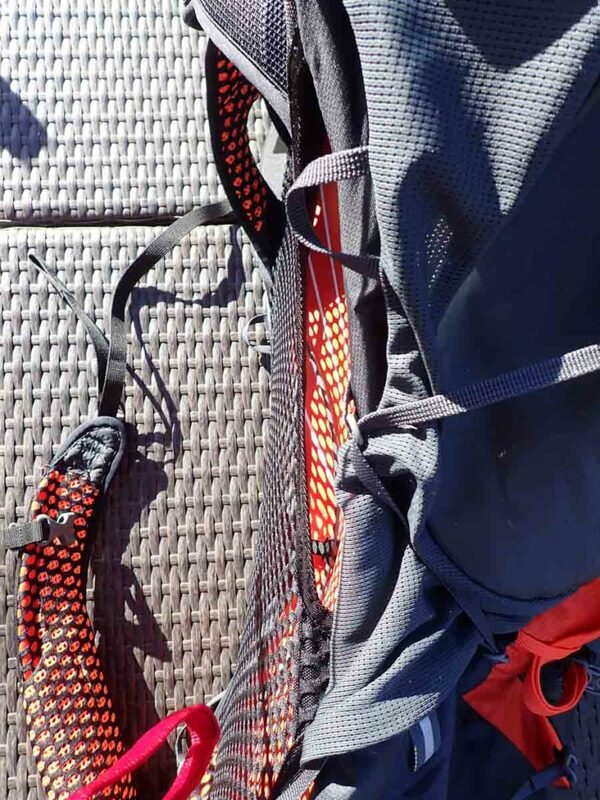 By far the feature that draws me back to this pack is the suspension system (Osprey call this their Airspeed Suspension™) that connects the pack to the user. The Exos pack has a ‘trampoline’ style system that apart from the hips and the shoulders provides an air gap along the length of the back. In summertime even on very hot days (30° celsius) I find that while I still sweat this is limited compared to packs that have full contact along the entire back; this system has been retained with the new model. The heaviest that I ever load Exos packs is 21kg and this is only when hiking in desert environments when I have to carry big water loads. I personally find that the Exos is comfortable although it a really heavy load was the norm I would probably opt for a pack that has more heavy duty padding. I am currently using my older Exos to pack train and at 18kg I still find it to be comfortable. 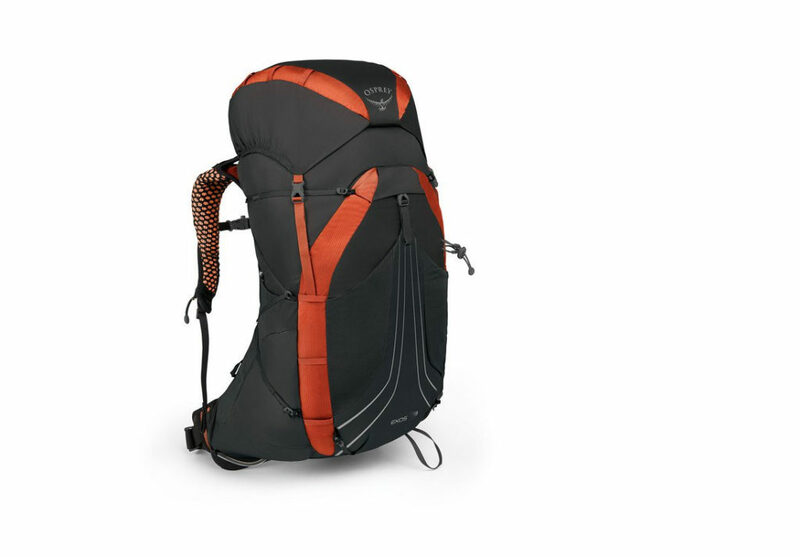 Now there are some negatives to this style of pack suspension in that when the pack is loaded with less than around 7kg it feels like its floating and becomes annoying so I never tend to wear this as a day pack as a result but will opt for models specifically designed for this purpose. Now for the new pack. The sizing on the Exos pack hasn’t changed and the large size has a capacity of 51 litres (the medium is 48litres) which includes the removable pack brain. I have never removed the brain from either my old pack or my new one as I love the internal; and external zip pockets to store all the little bits and pieces. 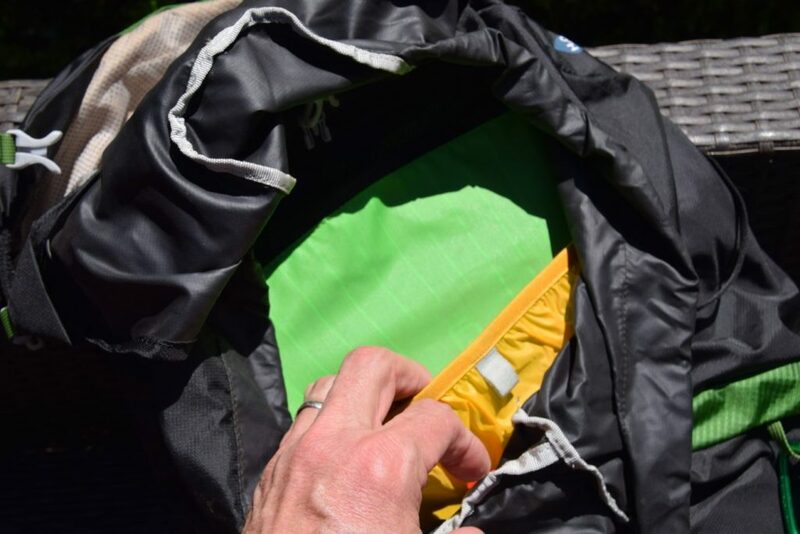 The large stretchy pocket at the rear of the pack is usually where I store my tent and with the light weight two person tents they comfortably fit into this stretch pocket even though they make the pack look a bit pregnant. The closure clip on this pocket now has a protective covering which while not necessary means that you won’t confuse this with other straps close by. If I am bush bashing through rough bush the tent will go inside the main pack. The feature that surprised me on this pack was the two side pockets that are typically used for water bottles and it wasn’t until I got my new pack home and started to load it up I realised that this pockets have been doubled in height like many cottage industry packs from the USA. I like this feature as it now means that my compact folding hiking poles will stow into these pockets with a good deal of security that I wasn’t willing to risk on the older model. I have also purchased a new smaller Jetboil stove which will suit my solo hikes very well and this stove also fits quite comfortably into these side pockets which means that I don’t have to open my pack up to get the stove out during the day if I decide to make myself a cuppa. The main internal pack cavity remains unchanged and with the gear that I now carry I find that I can get all my equipment and seven days of food into this pack without over stretching the pack. Gill owns an older Exos 58 and in her small size this equates to a 53 litres pack so at least in capacity its very similar in size to mine. 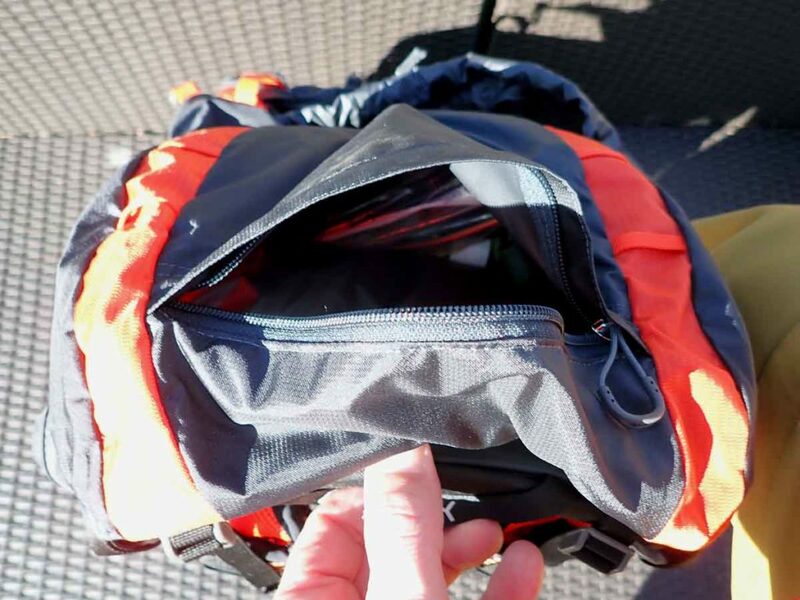 Its worth looking at the 48 and the 58 version of these packs because the physical dimensions are different enough to dicta that you go fo the larger size if you are carrying bulky equipment such as bear canisters when hiking in the USA. The internal water bladder pocket still remain in this pack but the feeder hole for the drinking tube that came out of one side of the older model has now been centred which means that the water tube can be comfortably used on either side, at least in theory. 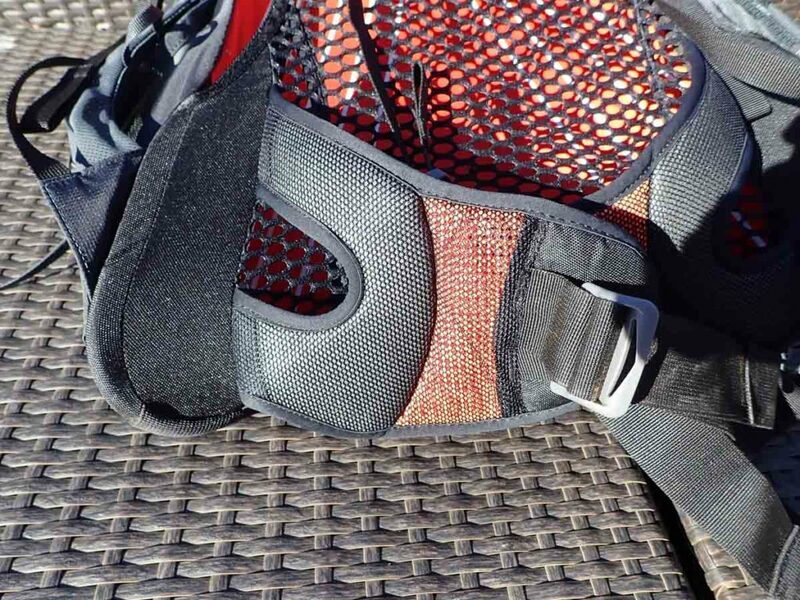 Given that the female end of the sternum strap is on the left hand side you would need to remove the drinking tube before taking the pack off if you do run it down the left side. Now lets talk about the features that Osprey have removed. I really did love the older Exos will all its little pockets. The small mesh pockets on the shoulder straps were where I kept some of the days snack as well as hand sanitiser. They were perfect for that and it I meant that I knew where to locate my hand sanitiser even at nighttime. The other pockets that disappeared where the undersized hip belt pockets which is where stored the bulk of my days snacks as well as some other little bits and pieces; for me this was a real disappointment. However what did surprise me was how free the front of the pack felt. Apart from the weight on my back and shoulders would be easy to forget the pack is there. Now I know that many people didn’t use the shoulder strap pockets and the loss of the hip belt pockets also won’t bother many people but this does bother me. As such I have purchased two after market hip belt pockets which will fit my small camera as well as one small pocket to go on my shoulder strap. One other consideration is that the waist belt has less adjustment which means that if your waist is anything over 106cm (42 inches) and you are likely to be wearing bulky clothing then you are definitely best off trying before you buy or if purchasing online from a supplier that has a good return policy to ensure that it fits. This pack comes with a great range of other features including numerous equipment loops and the well known Stow on the go™ hiking pole system. If you are using poles that compress rather than fold down this is a great systems and after a little bit of practice its very easy to put them away while you are still walking. I’ve changed to a lightweight pairs of poles that no longer suit this system. 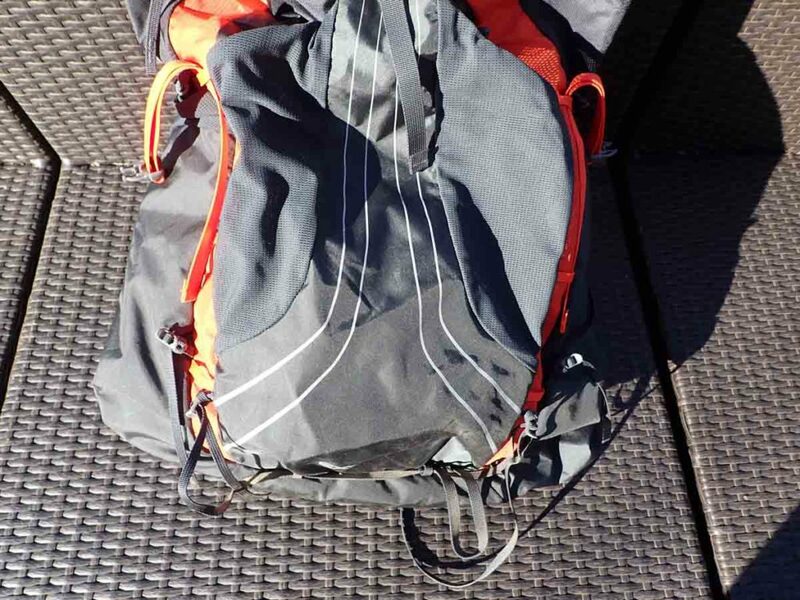 So overall despite Osprey removing some of my much loved features I still think that the Exos pack is well worth considering for those hikers who dont carry heavy weights and want a lightweight well featured pack. 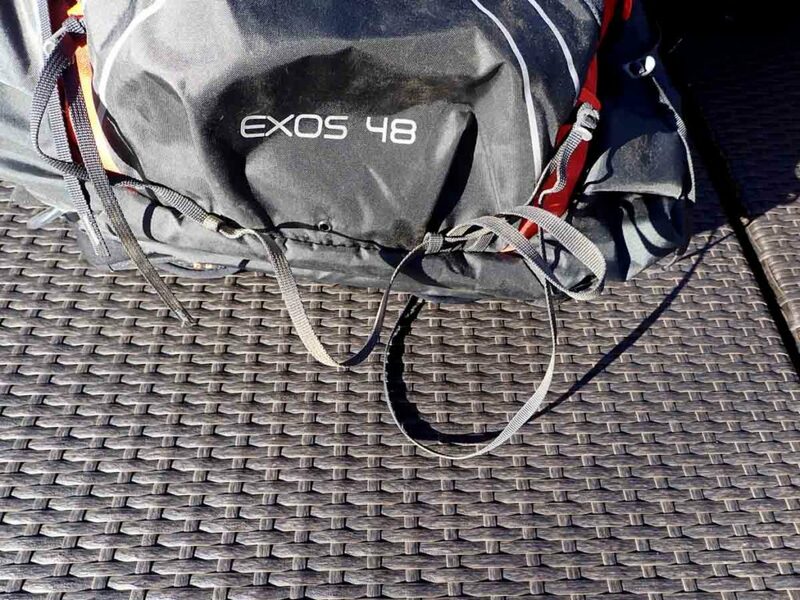 Most hikers will probably find the Exos 58 a better size but if you are have managed to trim the bulk that you carry, the Exos 48 is a great pack. 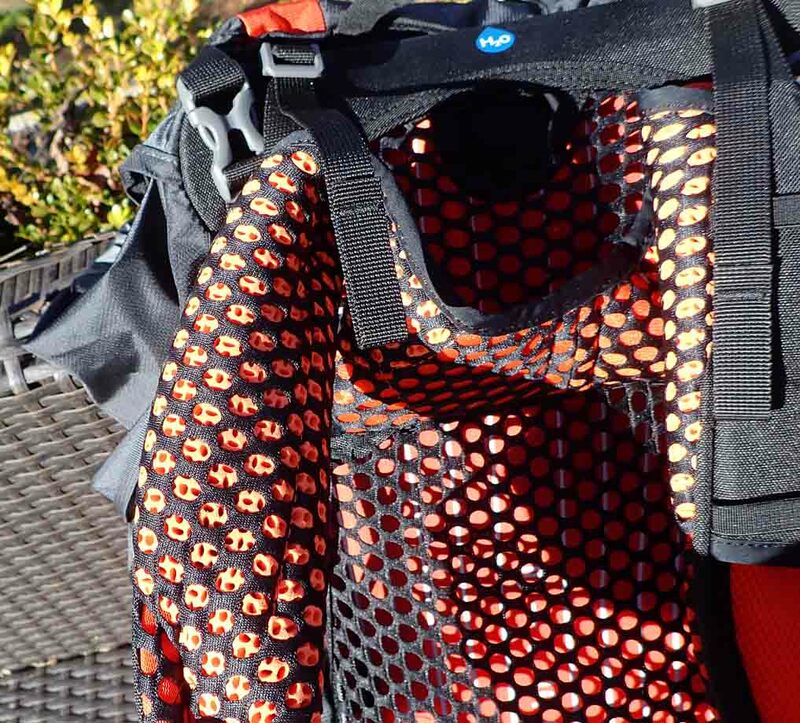 Lug your gear into the store if you are not sure and load up a pack to see what size will fit you. There is also now a female version of this pack called the Eja which is worth considering but don’t rule out the Exos just because is not a ‘female’ pack. 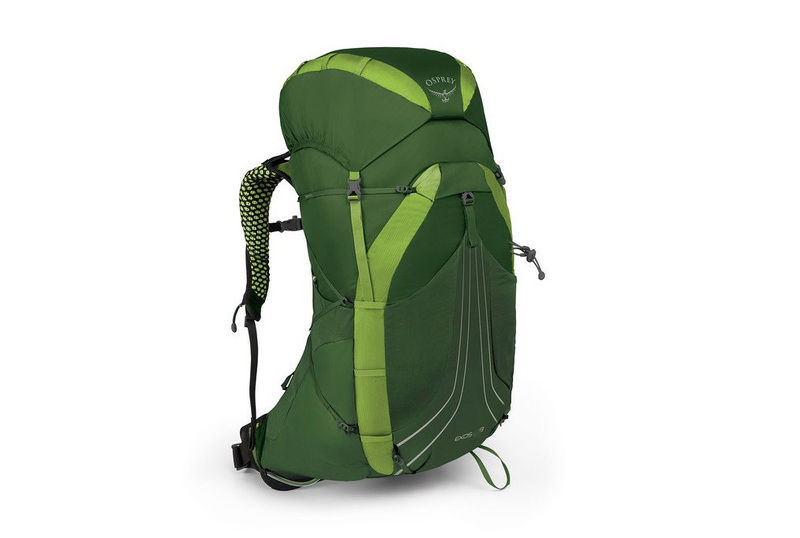 Please note: The Exos packs are one of the most widely sold packs world wide for use on the Camino in Spain as well as the American long trails. What this often means is that you can struggle to buy these packs early in the calendar year which is when the northern hemisphere hikers get them selves ready for their hiking season.